Drake has been teasing fans for several months now about his upcoming project More Life. 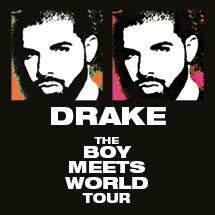 Recently during a tour stop in Amsterdam, Drake told fans who were in attendance that they should indeed attend his next show on February 26th, which will be entirely different as More Life will be out by then. While there isn’t a set release date for the project, we can assume it will arrive sometime between now and February 26th. The project will also be released as an Apple Music playlist, which is an odd move but could give insight into what the project may entail. There have been rumors that the project is supposed to be a compliation album which leads us to believe the project/playlist may feature other artists than just Drake. Perhaps a few OVO tracks, a few from Skepta, 21 Savage and of course some new material from Drake. Whatever the case may be, we’re ready. Atlantas trio has had a heck of a month. With only 31 days into the new year, rap group The Migos have been the centre of attention. With their new album Culture just dropping the group is blowing up. Quavo, Offset and Takeoff just released their album which features Gucci Mane, Travis Scott DJ Khaled and 2 Chainz. The group first got the biggest co sign of their careers when Donald Glover got on stage to accept his award for the show “Atlanta” and shouted Migos out by saying their hit song that went platinum “Bad and Boujee” is the song of the year. After that their numbers just sky rocketed. There is a petition being passed around saying that Migos should replace Lady Gaga to perform at the half time show at the Super Bowl this upcoming Sunday. The trio then did a mini interview where they said since the best team in the NFL, the Atlanta Falcons are in the Super Bowl the Best trio in Atlanta deserve to perform. I don’t know about you guys, but I defiantly would sign that petition.